﻿ Fiji Petrel photographed at sea. This is fantastic news. 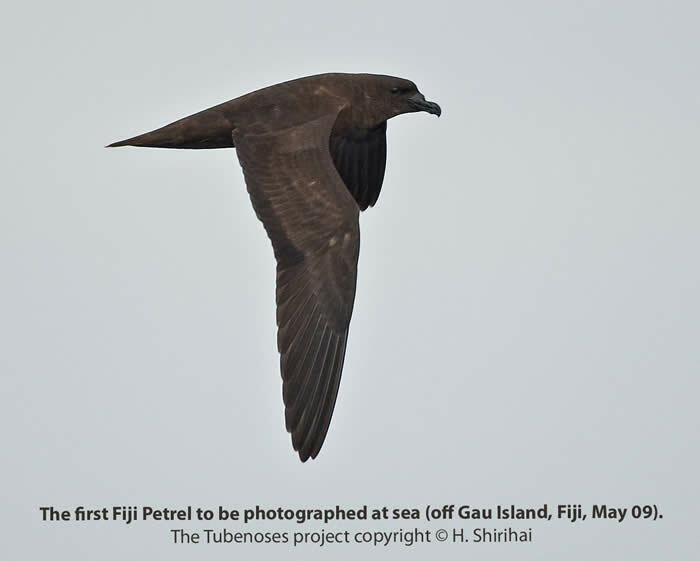 The Fiji Petrel has been seen and photographed off Gau Island, in the Fiji archipelago. A press release a couple of hours ago from Birdlife International reveals many details, such as the species is known only from one specimen collected in1855. That is 154 years ago. Alright, the article admits that there been a few reports of birds landing on the roofs on houses on Gau island that possbly were this species. But without photos or specimens, it is hard to be sure. The main ingredients of chum? Fish offal cut into small pieces and mixed with very dense fish oil, to which water was added and then frozen in 10-kg blocks. The chum was prepared a few weeks ahead by volunteers from the BirdLife Affiliate in Fiji, NatureFiji-MareqetiViti, the official BirdLife Species Guardian for Fiji Petrel. Frozen chum blocks persist for up to one-and-a-half hours, creating a pungent and constant oil slick, which attracts petrels from some miles away. On the second day, the first Fiji Petrel appeared, approaching the chum slick from downwind, slowly zigzagging over the slick, and suddenly changing direction to drop onto a small floating morsel. Hadoram Shirihai, the expedition leader and main author of the forth-coming Tubenose guide and Tony Pym a veteran seabird expert and bird guide are no newbies in the area. Already last year 2008 I received an email on the Seabirds Newsgroup on June 27 reading the following. Now only one place left! The chance to maybe see Fiji Petrel; never reliably recorded at sea to date. We have the right boat, tons of chum aboard (literally), and good/honest/reliable seabird companions to share with!! We need just one more pair of good eyes. This year’s mission to try and observe the Fiji Petrel at sea unfortunately had to be aborted after three days due to mechanical problems with the boat. Two chumming sessions on the journey to Gau, the island where birds have been grounded in the past, produced four Kermadec Petrels (only the second record for Fiji waters), a White-necked Petrel (though possibly a Vanuatu Petrel), 20+ Tahiti Petrels, four Collared Petrels and one probable, though brief, Providence Petrel. Of special note was a small ‘Cookilaria-sized’ dark petrel seen by three of the team, which flew under the Kermadec’s giving a direct size comparison. On the second day at sea we chummed some 16 miles southeast of Gau. Two Polynesian Storm-petrels (the first confirmed in the Fiji and Samoa biogeographical region for 132 years) were observed plus two more Kermadecs. Tahiti Petrels numbered about 16 over a three-hour period and two Collared Petrels were distant. Once more, a small dark petrel was seen momentarily, only to fly into the sun’s glare. Following the boat’s technical problems the group decided to fly to Taveuni in the Fiji Islands and try for seabirds there (and the endemic landbirds in any spare time). We could charter only a high-speed sports boat and chummed the first day 18 miles offshore and the second day at the Vuna seamount. The highlight was a White-bellied Storm-petrel (a species never reliably confirmed from Fiji waters) on the first day and three Gould’s Petrels on the second. Day totals were 50+ Tahiti Petrels, one Collared Petrel on the first day and 30+ Tahiti Petrels on the second – on our return to the quay at dusk we had a gathering of an additional 50+ Tahiti Petrels, waiting to return to their breeding burrows ashore. So the expedition for Fiji Petrel had to be aborted after the second day due to engine malfunction. The members of the team must have felt very heart-broken, especially those that had chipped in at the very end. Nevertheless, some good birds were seen. The small all dark “Cookilaria” sized dark petrel could have been the Fiji Petrel which is remarkably small. I wonder what the team-members think of this bird in hind-sight. 2009 and a new expedition in 2010. 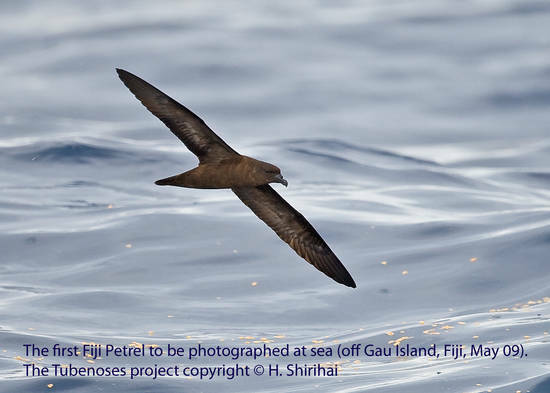 The present successful expedition was carried out in May 2009 and the results are being published in Bulletin of the British Ornithologists’ Club (The first observations of Fiji Petrel Pseudobulweria macgillivrayi at sea: off Gau Island, Fiji, in May 2009 Bull. Brit. Orn. Cl. 129:129-148). Only 8 birds were seen in 11 days, which indicates that the species is extremely rare and deserves its Critically Threatened status. Since molt patterns and tentative age was observed, predictions can be made when to best search for the species at land. Finding the breeding areas is the most important step for its conservation. A new expedition to find the breeding area is planned in 2010. I have had the pleasure of meeting with both Tony Pym and Hadoram Shirihai. Although, I can’t say I know them well, still well enough to feel comfortable to send off some questions. I hope to get answers by tomorrow to follow up on this teaser. Stay tuned!. Read the interview here. Previous post: News from Amarakaeri- the communal reserve next to Manu.